Last week I received an excellent article from Variant Perception on “Market Tops”, and have permission to excerpt some of it. Here is a link to the summary page of Understanding Market Tops. What follows are a few snips from the full report. 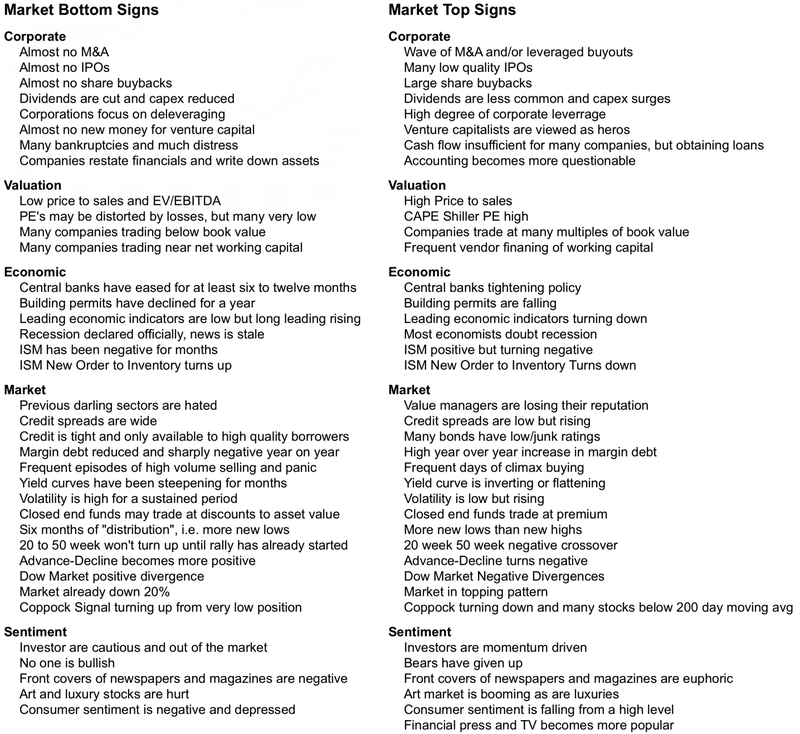 In the following table, we summarize the signs of market bottoms and tops. The signs can be divided into the following categories: corporate, valuation, economic, market and sentiment. Clearly many signs of a top are in place, but there are many characteristics that are currently missing. In the coming pages we will look at each category separately. Today the market shows many of the elements that are present near market tops. In particular, sentiment is extremely bullish, investors are long and leveraged, and valuations are extended on a wide variety of measures. However, leading economic indicators are still not negative, and so far breadth and technicals have not deteriorated. The medium-term stock market returns are likely to be negative due to excessive valuation, but there is no imminent sign of a medium-term market top. Tops are a process, not a single event. They tend to last a long period of time, and markets whipsaw traders and disappoint bears and short sellers. 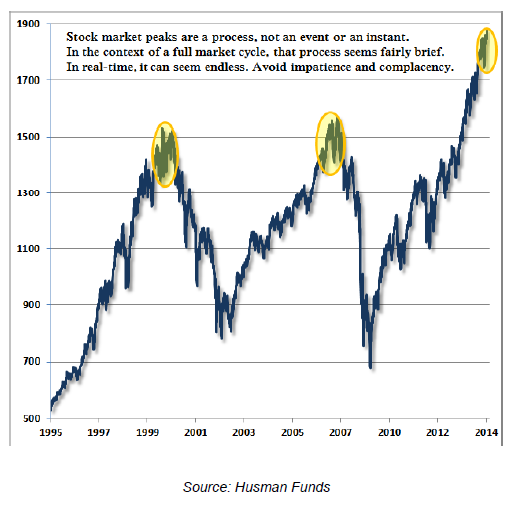 For example, many signs of a market top were clearly visible in late 1998, but it was not until the end of 2000 that most major market indices started to collapse. Likewise, many elements of a market top were evident in late 2006, but markets didn’t begin to collapse until very early 2008. CEOs are bad capital allocators of corporate cash and provide contrarian clues, but insiders are much better at providing insight with what they do with their own cash. A CEO should issue shares when they are overvalued and buy them back when they are undervalued. Likewise, a CEO should buy competitors when they are cheap and avoid overbidding when prices rise. Unfortunately, most share buybacks and most mergers and acquisitions happen at very high prices near market tops, and companies divest units and issue shares near market bottoms. Insiders, however, are smart. 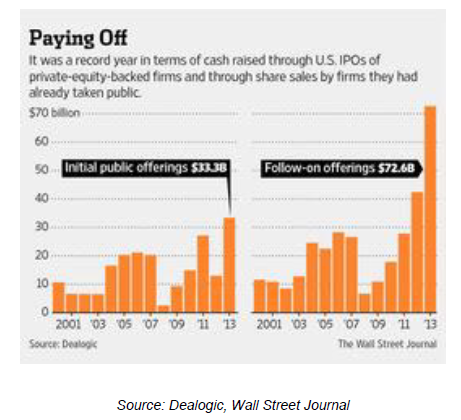 IPOs surge near market tops as insiders sell out. Also, near market bottoms insiders buy their own stocks. The fewest buybacks in each cycle happened when stocks were cheapest. It is impossible to make this up. 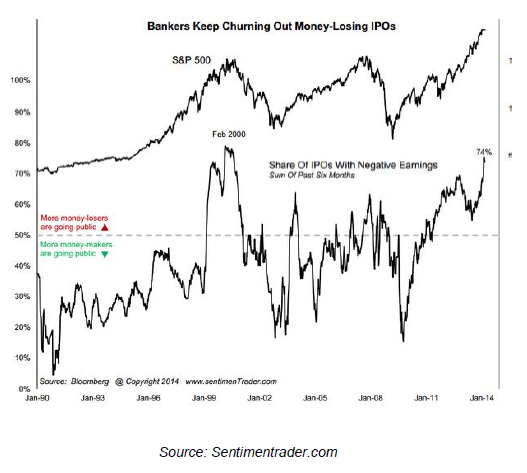 CEOs are just like “dumb money” retail investors, buying high and selling low. If you look exclusively at the US, you can see that M&A levels are very frothy and are near where they were in 2007. Greed is alive and well in the US. They are significantly below levels seen in 2000, but that was the biggest M&A wave ever and marked the peak of telecom, media and internet bubble. It included the likes of AOL’s purchase of Time Warner and other mammoth deals. One area that currently is frothy is the biotechnology sector. The number of biotech deals is the highest it has reached since 2000, and the dollar value is the second highest in history. During the final phases of bull markets, not only does the number of IPOs rise, but the quality of IPOs deteriorates. The following chart shows that only during the final phases of the internet bubble did we see such a high percentage of money-losing IPOs. Investors are chasing unproven business models. In the past decade, private equity players have become more important “insiders”, and the number of IPOs from private equity backed groups has now reached all-time highs. Furthermore, the follow-on deals from private equity sponsored groups are also at all-time highs. Smart firms were buying companies in the bad times and are now floating them and getting out while they can. CEOs and managers tend to overpay for share buybacks and for M&A activity with shareholder money. They don’t mind sticking it to investors. However, when it comes to their own personal money, they are much shrewder. Insiders consistently sell their own stock when markets are high and buy large quantities of their own stock when markets fall sharply and become cheap. In May 2013 Variant Perception wrote a report titled Credit Bubble, Toil and Trouble. We argued that ultra-low interest rates were already leading to a bubble in corporate debt. Investors were issuing large quantities of corporate debt at low spreads. The situation has only got worse since we wrote in our report. 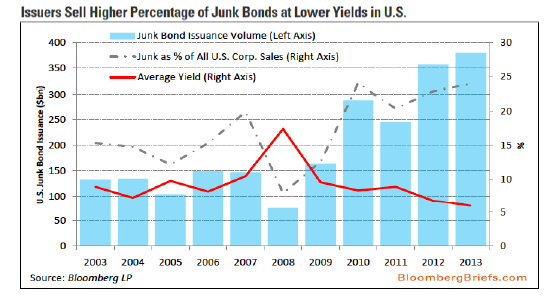 As the following chart shows, in 2013 we saw the highest issuance of junk bonds ever. This was true in absolute numbers and as a percentage of all corporate debt. Not only is the issuance of junk at record highs, but we have seen the highest LBO transaction volume since 2007. In fact, the market peak in 2007 is the only year where we saw more leveraged buyouts. There is much more in the 28-page report. You can request a copy from the link at the top.